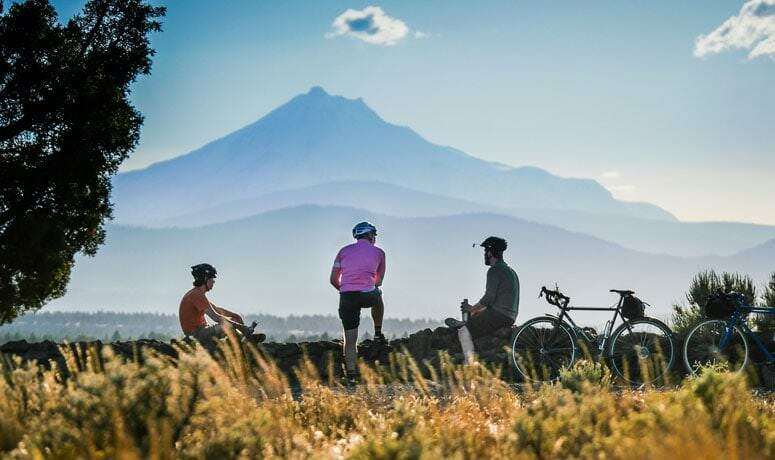 A sawblade of snowy volcanic peaks provides quite the backdrop for the Madras Mountain Views Scenic Bikeway. This 29-mile ride rolls through farm fields and skims along the canyon rim of Lake Billy Chinook. A word of advice from one cyclist to another: The scenery might get distracting, so you’ll want to pull over now and again to take it all in. The route begins and ends in Madras, the lively hub for this sun-soaked Central Oregon basin. (While summers can get hot, the region’s mild winters make this a pleasant ride year-round.) The bikeway quickly leaves the city behind as it climbs gently west, topping out on a broad plateau of ranch lands and crop rows. The Cascade Range suddenly rears up across the horizon, a string of snow-dusted peaks and buttes. Mount Jefferson stands front and center, flanked by Mount Hood to the north, then Three-Fingered Jack, Mount Washington, the Three Sisters, Broken Top and Mount Bachelor. With the mountains framing the western horizon, the route zags west and south along lightly traveled ranch roads. In spring, kid goats frolic in the fields, and horses munch on fresh grass, happily shaking their blond manes. Hay bales stack high along weathered barns, pretty as a landscape painting. 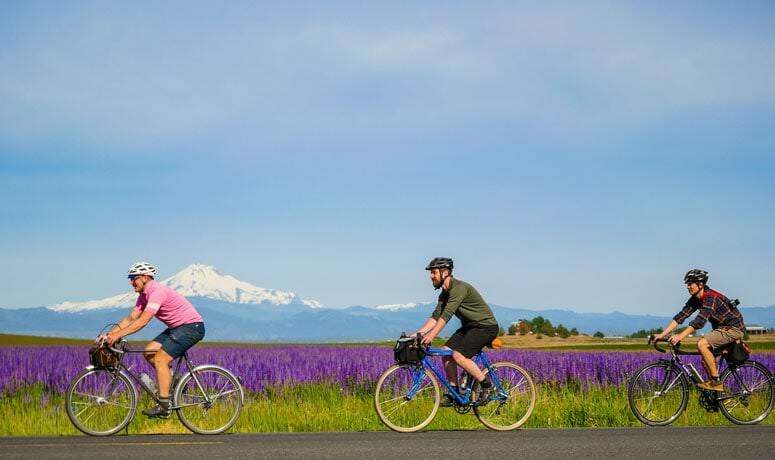 As you ride into the river town of Metolius, marvelous scents from young crops go along with the region’s sights. Aromas of mint and garlic mingle in the light breeze; in June, white carrot blossoms infuse the air with sweetness. One of Oregon’s top agriculture areas, Jefferson County grows much of the nation’s carrot-seed crop, along with other seed crops like grass and potatoes. 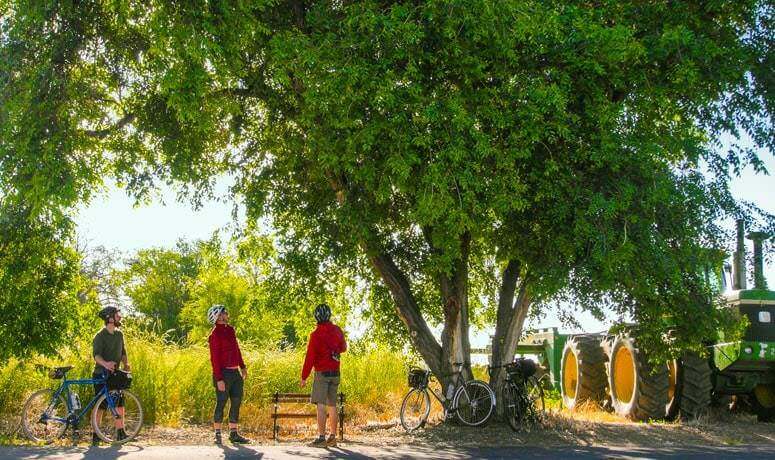 The community of Culver provides a good rest stop at about mile 11, before the bikeway route begins to swing northwest toward The Cove Palisades State Park. At the park entrance, Jordan Road winds downhill to the shoreline of Lake Billy Chinook, and the bikeway splits off north onto Mountain View Drive. The patchwork of farm and field quickly gives way to a high-desert landscape of silver sage and shaggy juniper trees. 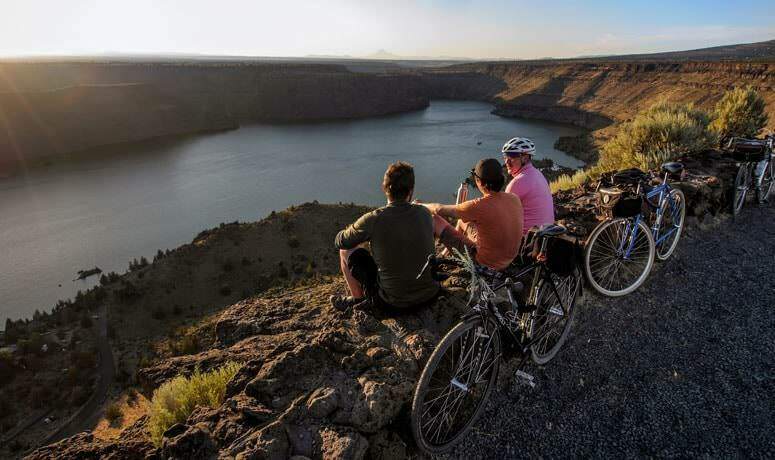 Then, just a few yards west of the bikeway, the land abruptly gives way altogether: Short gravel lanes lead to the rim of a deep basalt canyon, where Lake Billy Chinook sprawls out like an inkblot nearly 600 feet below. Three rivers – the Metolius, the Crooked and the Deschutes – come together to form this multi-lobed waterway, named for the skilled Wasco scout from nearby Warm Springs who guided 19th-century explorer John Fremont. Bikepackers can nab a campsite at the state park to enjoy its swimming beaches, desert hiking trails and boat rentals. Near mile 20 of the bikeway, a half-mile side trip leads to Round Butte Overlook Park. A glass-walled visitor center and open-air deck offer another cliff-top perch overlooking the north end of the canyon, where bald eagles, golden eagles and other raptors soar past. It also gives visitors a good look at the Round Butte hydroelectric dam, which holds back the lake waters and generates electricity for the Portland metro area. After a heart-pumping half-mile climb from the park, the bikeway turns east. A couple more hills lie ahead, as the route gradually returns to farm and ranch country. Then it’s one final downhill coast, looping back into Madras. 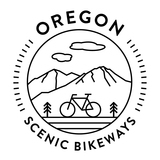 Find more to see and do near this Bikeway at Sisters Country or Visit Central Oregon. The Cove Palisades State Park near Culver offers RV camping and showers. Please note that to access the park you’ll have to travel down a very steep, long hill from the bikeway. In addition to TripCheck.com, please contact the Jefferson County Public Works department at (541) 475-4459 for current information about road conditions.